Diamond Color is one of the most important factors to consider, as it is noticeable to the naked eye. A diamond's color is graded by GIA on an alphabetical scale from D to Z, with D being absolutely colorless and Z being light yellow. Beyond Z-color, a diamond is considered to be a "fancy" color. 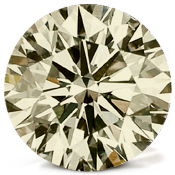 Although many diamonds appear to be colorless, some have at least a hint of body color. A diamond's color has a significant impact on its value. To ensure the highest quality diamonds for your selection, Adiamor carries diamonds in the color range from D to J only. When buying a diamond, take into consideration that it is often very difficult to detect the difference between a colorless diamond (D to F) and a near colorless diamond (G to J), especially when it is mounted in jewelry. Diamonds with a K to Z color grade usually have yellow shading that can be detected by the naked eye, however, a well cut stone with good proportions will still release the brilliance and fire of a lower colored diamond, dispersing light in such a way so as to create a beautiful stone. Fluorescence is not directly related to a diamond's color. This separate characteristic refers to the diamond's ability to fluoresce under ultraviolet (UV) light. Our sun emits some UV light, but it is usually not great enough to detect fluorescence. When exposed to UV light, many diamonds will give off a distinctive glowing blue coloration. Although fluorescence may be displayed in various colors, blue is the most common in diamonds. The fluorescence of a diamond is defined by its intensity as either None, Faint, Medium, Strong, or Very Strong. Although fluorescence is a characteristic that can be measured, it is rarely an issue when selecting a diamond and is usually not detectable to the eye. The impact of fluorescence on price depends on its noticeability. Faint fluorescence has very little effect on a diamond of any color, and therefore has no effect on value. For some higher color stones (D to G), strong fluorescence may give the stone a milky white appearance, which greatly lowers the value. Fluorescence often adds value to stones with a hint of color, such as I-color and below, as it can give the diamond a whiter, brighter appearance. Diamond fluorescence is a complex science, but in the world of diamonds, a fairly straightforward quality grading process. At the end of the day, the "eye is in the beholder" - but note that the highly fluorescent diamond is not necessarily the best! How do naturally colored diamonds end up with some of the many amazing hues that we attempt to recreate in much more common colorless stones? In truth, there are a number of factors that must fall into place in order for the Earth to create these colorful treasures naturally. Here’s a brief overview of the conditions necessary to create these fancy gemstones. You probably know that diamonds are created by carbon that is both heated and compressed, then pushed to the surface of the Earth (or close to it), resulting in the colorless stones that are the bread and butter of the diamond industry. However, no diamond is perfect, and it is the impurities in the stone that can cause coloration. This works in a couple of ways. First, carbon is rarely found in a completely undiluted state. Often there are other elements in the vicinity that can lead to slight discoloration in the finished product, which is why colorless diamonds are so desirable. However, even rarer than completely colorless diamonds are those that display the intense color indicative of mass amounts of some other element in the environment. Boron, for example, will lead to rare blue hues in diamonds while nitrogen will produce the much more common yellows and browns. Radiation will produce a green color (uh, kryptonite, anyone?) and unusual stresses that trap electrons in the stone are thought to result in pink or reddish hues. But that’s not all there is to it. Flaws within the stone can magnify or even cause coloration because of the way light entering the stone is refracted. For this reason, a stone that is already colored may be more appealing with a flaw since it can greatly enhance the color, pushing it into the class of a “fancy colored diamond”, which makes it exponentially more valuable. It’s pretty interesting that the impurities and flaws in diamonds can actually add to their value, but remember that they have to achieve fancy color status in order to be worth more. If the color is pale in a stone, it will hold a low value since it is neither colorless nor saturated (making it one of the most common geological blunders). So before you buy a rare colored stone, make sure it meets proper standards of rarity so that you get a diamond that is as valuable as it is desirable.